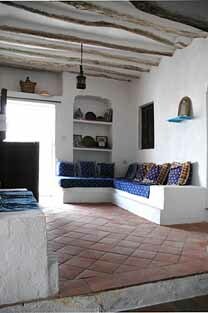 description: Casa Organic is an atmospheric Moorish style white pueblo village house surrounded by the beautiful mountains of the lower Alpuharras and is very accessible to both the beautiful city of Granada home to The Alhambra and Moorish culture/architecture and accessible to the beautiful coast and beaches of Solabrenia and Almunecar. 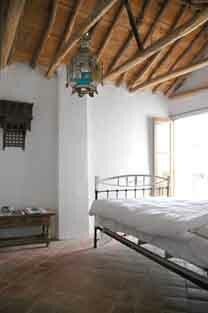 The house consists of stylish traditional bedrooms and living spaces. The terrace has spectacular views of the lemon and olive groves surrounded by breath taking mountains. 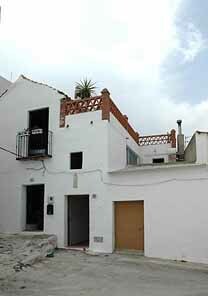 The house has four double bedrooms and a bathroom and shower on the terrace. As a traditional house it still expresses the passing of time with its thick cool walls for the summer and the kitchen is blessed with a patio to enjoy over your leisurely breakfasts. Visitors usually eat out in the surrounding villages' bars and restaurants or on the terrace whilst taking in the panoramic views. The area is great for swimming in the glorious local pool and restaurant, walking, cycling and sampling the local tapas and food. During the winter months many of the visitors and villagers drive to the Sierra Nevada to ski and then drive to the beach for lunch on the beaches. We also drive or take the bus into the Granada. 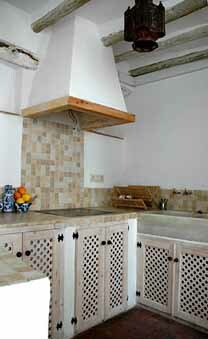 It is possible to arrange for organic cookery and lifestyle courses for numbers of 10 and more. The house and surrounding homes can cater for corporate training days, breaks and courses. The prices range from £250 to £350 per week depending on time of the year and numbers of people. May, June, July, August, Sep, Mid Dec to Mid Jan are peak season. Change over days are usually on Sat/Sun and in some cases it is possible to be flexible about exact days. There are inexpensive flights from London to Granada on www.ryanair.com which means a half hr drive to Casa Organic. It is always easy to get great value flights from London to Malaga which means a 2hr drive along the beautiful coast rd from Malaga to Granada taking in the many spectacular beaches. surroundings: the village is one of a cluster of white pueblo authentic spanish villages in the heart of traditional rustic spain which are surrounded by olive and lemon groves and beautiful views. The villages' contain many traditional bars and restaurants and have magnificent fiestas highlighting local music and traditions. Visitors are always welcome and invited to be part of these great festivals. The villages grow many organic foods and have a comprehensive recycling scheme and electricity is provided by wind turbines. We can also Carbon Positive your flight so as to make a positive impact on the carbon pollution generated by your flights and energy use.